After Fall, the atmospheric story-driven puzzle platformer due this September on PC. Enter a world ruled by nature and magic as a wild fox with a fantastic ability: a supernatural control over the seasons to shape the environment and progress in this mystical adventure. The Gamescom Trailer tells you more about the story and the enigmatic spirit that will guide your way along your adventure. This spirit is in search of the fragments of the Seasons and needs an envoy to meet the Guardians of the Seasons, large ancestral creatures who embody the essence of the Season they are protecting. You need to gather these fragments to complete the Ritual of the Seasons, allowing this mysterious spirit to realize her dreams... and yours as well. Use your ability to change the seasons and manipulate the world around you. Use the rain from Spring to raise water levels, then the cold of Winter to freeze it up, granting you safe passage. Become entranced by the charms of this contemplative and poetic adventure, inhabited by the bewitching melodies of a string quartet. In Seasons after Fall from Swing Swing Submarine, you are a wild fox embarked upon a perilous adventure, with mystical powers that allow you to manipulate the life of the forest through dynamically changing the seasons; powers that open new pathways and opportunities throughout the game-world depending on the chosen season. 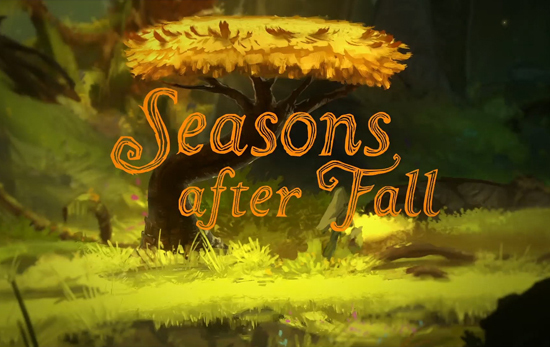 Seasons after Fall encourages the player to explore a gorgeous 2D graphical world, accompanied by an enchanting soundtrack recorded with a live string quartet. Travel in search of the Four Guardians to reunite the scattered Seasons and restore order in the Forest. Summon Winter to freeze a waterfall to pass, or call for Spring to make plants and flowers bloom, guiding you to previously inaccessible zones. Travel across forests, rivers and caves, and manipulate an ecosystem that is as uncanny as it is marvelous to unveil the secrets of this world. Control the Seasons at will. Solve organic puzzles with various living creatures. Freeze, grow, and change the environment dynamically. Explore and discover an unknown world. Run, jump, yap, explore the world with no pressure. Meet the Guardians, strange divinities of the seasons and uncover a dark story. Enjoy the environment in all serenity, without enemies nor interface.